Turned edge technology is a useful and durable option when creating ring binders. This process gives cases, binders and other products a beautiful book-like feel. In this process, the edges of the binders or cases are turned and a piece of cloth or paper is attached to it. This process doesn’t just provide an aesthetically appealing look but also makes the cover resilient. Therefore, turned edge ring binders can efficiently withstand regular wear and tear. This protects the documents stored inside the binders. Turned edge binders give a rich feel while protecting and organizing documents. Turned edge ring binders are available with square backs. You can choose between round and square corners. Multiple high-speed case makers are utilized to produce these binders. 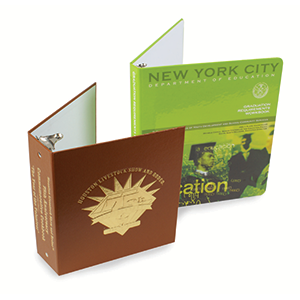 The cloth and litho printed covers lend an elegant feel to the binders. The automatic hang riveters provide additional organizational convenience. To create a luxuriously rich feel the options of foil stamping, embossing, and debossing are also available. Ad Industries provides several customizable options in terms of features and design to provide you with ring binders that are superior in quality and tailor-made according to your specifications. With a detail-oriented approach, that has been honed and perfected in the last 60 years, we are able to provide bespoke solutions to our clients. Our products, services, and solutions are made to help our clients get the most from the product and money spent.